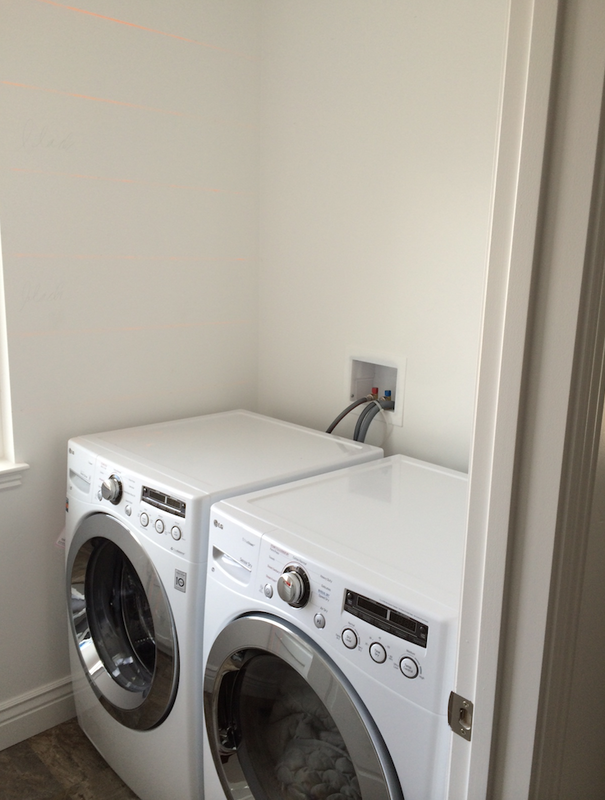 Honestly, I used to loath my laundry room. The only reason I’d go in there was to tackle the never-ending vortex called “laundry” and get out of their as quickly as possible. It was one of the most boring rooms in my house and it was time to give it a makeover. Then I did what most design crazed persons would do, hopped on Pinterest and scoured the internet for the most beautiful laundry rooms I could find. 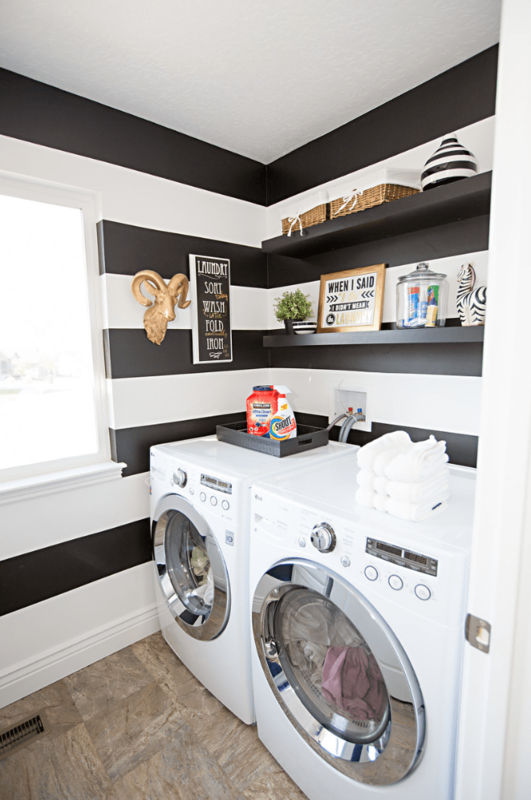 Here is my average laundry room before the “surgery.” I’ve been obsessed with black and white lately and decided to go with stripes. 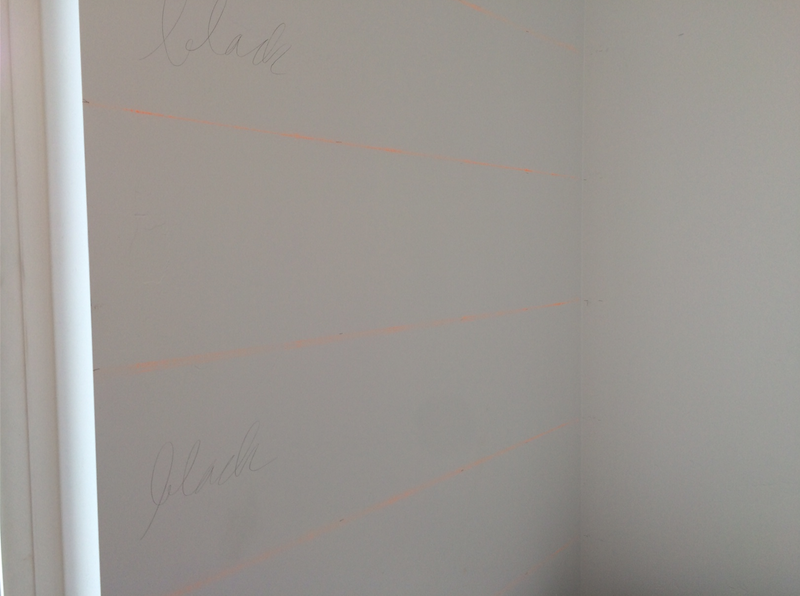 Using a measuring tape, I marked the walls on the left, middle and right sides of the wall every nine inches. I decided on nine inches because the ceilings are 9 feet tall and I wanted there to be ten stripes. Then using a chalk line, I secured one end with a push pin, pulled it tight (exactly over the marked lines.) Once its very tight, pull the string back and release to make a chalk line on the wall. To help give myself a visual, I wrote “black” where I wanted the black stripes to be painted. Then I tapped off the lines making sure to push it firmly against the wall to minimize bleeding. The real trick to prevent bleeding (especially with stripes) is to paint the existing wall color over the tape first. This technique almost always gives you perfect paint lines because paint almost always bleeds. If you bleed the paint with the existing wall color, you can save tons of time fixing bleed marks. After painting the black stripes, adding black shelves, accents of gold glam and my personal favorite, the golden ram head, I absolutely love the transformation! It makes me so happy to walk into my laundry room now. Sometimes I even leave the door open just so I can look in there, miracles happen. Here is the link of the tutorial I followed on Youtube. Enjoy! Oh my goodness this is awesome. I paint and do all sorts of other things, but I have always shied away from stripes. This room is really pretty!!!! Great Job! I found you on Wake Up Wednesday. I hope you will visit my page as well. http://clearissacoward.com/ To your success. Thank you so much! I love your site, I’m trying to find a follow button… Can you attach a direct link to follow you? I love this! 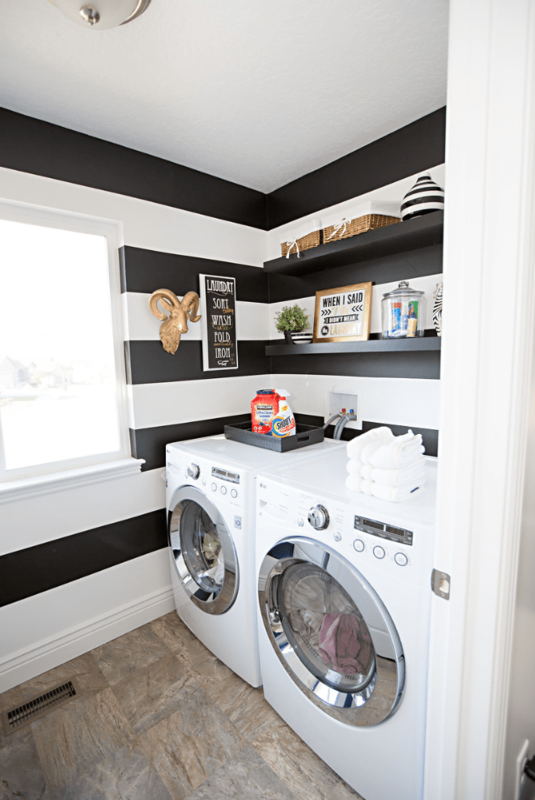 I have been wanting to do black and white stripes in our bathroom with splashes of gold so this is right up my alley! Nice work! You should give it a makeover!! I want to see it!